One of the biggest time sinks of prepping the Turbo Schnitzel car last year was getting a roll cage into it. The XR4Ti wasn't incredibly popular, so finding a prebent cage was problematic. We ended up piecing together a kit using a main hoop intended for a dodge something-or-other and the A pillar struts from a Mustang. 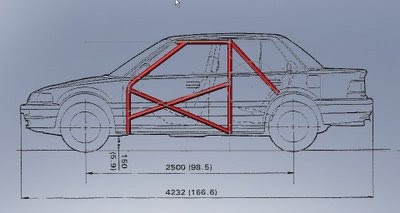 I had hoped that since the Civic was a much more popular car than the XR4Ti, we'd be able to easily find a cage for it. Alas, since the Civic DX 4 door is not your usual choice for a drag car, we've had a bit of a problem finding a pre-bent cage. I guess the whole Honda tuner phenomenon was focused on coupes rather than the budget economy transportation look of the sedan. The closest I've found is a CRX cage, but it's significantly shorter than we'd need for Our Lady. We also have a few requirements for our fan mounting, so it looks like we'll be doing a custom cage. I've scanned in the drawing of the car from the service manual and I've been using as a template to design a cage in SolidWorks. We'll do some verification of the dimesions using some PVC pipe (1-1/4" sch 40 pipe has ~1-5/8" OD). Once we have the plans in CAD we can easily make drawings and have a local shop do the bending. Online auto repair manuals is really useful for those who want to have the total idea of their car and also can have the help from the website's personal mechanics if they have any problems regarding the cars.